For the first Merioneth Naturalists’ field day of 2012, only two of us ventured out, meeting in the Trawsfynydd Power Station car park, on a day that was cold but dry. 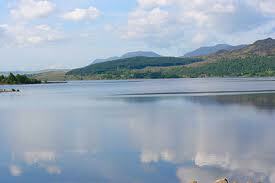 We first went down to Llyn Trawsfynydd shore to the east. We trawled through the drift line detritus, finding it to consist mainly of Callitriche stagnalis, with some Littorella uniflora, with its leaves looking spongy in cross section, and began our recording. The meeting was billed for bryophytes and lichens and on bare soil close to the lake we found most beautiful specimens of Pogonatum aloides and P. urnigerum, both plants bearing splendid capsules or with deep red male ‘inflorescences’. We then followed the road west, towards the dam, and sorted out the differences between Hedera helix and H. hibernica recording H. hibernica with its remarkable stellate hairs, all the rays lying neatly parallel to the leaf surface, and its strong smell of pine. We turned off towards the lake, searching along the shore for marginals, but the water was high, and the wind was blowing waves hard onto the shore, and we had little success. After eating our lunch, sitting on a rock in the forestry out of the wind, we crossed the dam and followed a wall, which gave us Asplenium adiantum-nigrum, A, ruta-muraria and Phyllitis scolopendrium. We clambered down close to the shore on the far side; it was hard going, rocky, with great bushes of Ulex europea blocking the way, but further plants were added to our list. We walked back along the tarmacked road, and noted a lone plant of Leycesteria formosa at the edge of the forestry, looking very alien with its multiple tall, chunky stems. We continued recording new species, and finally had a satisfying list of over sixty for an under-recorded monad. The day ended with the near hills turning red in the setting sun, and the Migneint in the distance white with snow.